When I started gathering these statistics the aim was to put together a post on the difficulties of associate cricket. That will now be part three. Australia's recent, somewhat lamentable, performances have allowed me to retool and add to them to create a broader picture of how talent appears from a playing base, how it improves and declines with age, and the challenges in creating a competitive environment for much smaller teams. Australia's challenges against England and before that India and South Africa need to be kept in perspective. They are still rated as an above average test team - let alone amongst the ICC's 106 cricket nations; they are the most successful, the equal oldest test team, the second or third richest in annual income, the third largest test team in gross domestic product - one of the best indicators of sporting excellence. The total playing base is 800,000 plus, of which around 500,000 play in club competitions, equal with England and South Africa. There are good reasons to think Australia aren't adequately developing their talent - on which I will try and show in part two - but these are persistent problems, and problems not unique to Australia: talent must be spotted from within a large pool and this is very difficult; it must be kept in the game while it develops, which in the modern world means paying under-performing youth; and selecting the right players based on a handful of data points means talent and temperament spotting is often as important as analysis and results. The rejoinder that these weren't problems ten years ago is false; they were, but when you have Warne, McGrath, Ponting and Gilchrist, it doesn't matter if selectors choose a batsman with a career average of 35 over one of 45 for several years. The team is starting 100 runs ahead of average. That is not the case when a team is at its normal level. Likewise, the current Australian team is not that dissimilar to the one that played in 1989. That team had recently, and continued to be until 1993, dismantled by the West Indies. It was youthful, and where it wasn't - Border aside - it wasn't performing terribly well. But it came up against an English side that only beat Sri Lanka and a terrible Australia over a 4 year period. A team most of the Australian batsmen of the era averaged 5-10 runs more than their career average against. That's the luck of the draw, but it is worth remembering. Australia can't be great all the time. They draw on the far-end of the talent curve, (hopefully) picking the best six batsmen available, and then (hopefully) they perform near to or above their talent. Over the course of test history Australia's population has increased, as have several comparable nations. For the purposes of this exercise I'll compare New Zealand, a nation with roughly a fifth the number of cricketers as Australia, and therefore (at least in theory) they will have a fifth the number of batsmen at each elite level - meaning they'll select a lot of weaker batsmen. In order to create blocks with sufficient number of data points, I've looked at performance by batting position, not individuals, split into three year blocks. I'll also be looking at the reciprocal of the average - more easily understood as the probability a batsman makes another run before being dismissed - because it better fits a normal curve. 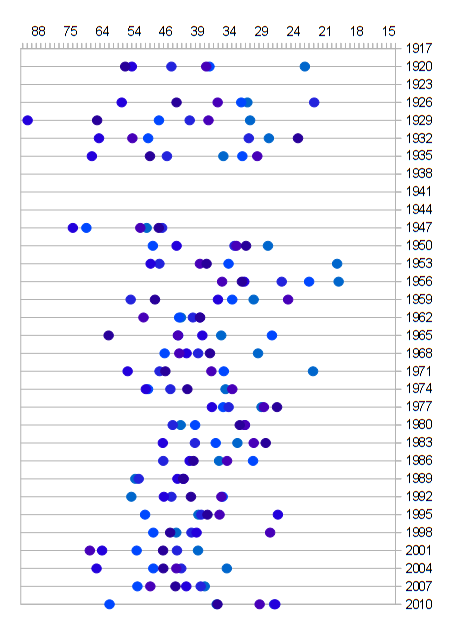 Below is the graph of Australia's talent distribution, for batting (bowling is much harder to analyse by position) dating back to the 1920s - when overall averages leveled out to approximately the current level. The current period is unusual in having two positions in the bottom 5% of historical performances and one in the top (number five, needless to say) but a t-test isn't significant at the 5% level. In fact only four lineups are: the invincibles of 1947-1949 (well above), the mostly all-rounders Laker-bait of 1956-58 (well below), the WSC years of 1977 (below) and 2001-03 (above). Expecting the present lineup to be anywhere near the last of those is crazy, and matches previously weak teams (the mid-80s) or weaker sides playing strong English sides (the 1950s). This graph shows the historical distribution of three-year position averages for several teams, and some modelled distribution probabilities for different sized playing bases. Needless to say, the probability of getting Bradman is miniscule, but it is mostly interesting for what it says about the effect of playing base size. Two things stand out on this graph. Firstly, modelling talent is hard, because variation in performance is huge. In theory the worst players in the side should be a mass of replacable pieces - that's not to say you should replace them, merely that most replacements are as good as each other - but players can fail to meet their true talent for long periods - Steve Waugh, after 52 tests, the same as Bradman and Ramprakash, averaged only 34. Hence the long swinging tail, accentuated by the log scale. 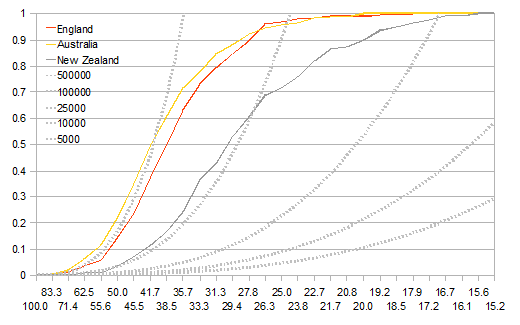 Secondly, the first modeled dotted grey lines is fitted to Australia's talent curve. The others, from 100,000 players (roughly New Zealand) down to 5000 (roughly the Netherlands), are calculated from Australia's line. Each average on the 100,000 line has one fifth the probability of occurring as on the 500,000 line. Australia and England have similarly sized playing bases, and both sit quite close to where they ought to be. More interestingly (and the fit is rather remarkable), New Zealand's historical distribution line meets almost exactly where the model predicts. Any team can luck into having great players, but the bigger the playing base, the higher the probability. Every team is constantly rolling the dice and hoping to draw a collection of high performers - and even small playing bases can produce excellent teams, if intermittently. A nation can also fail to use its vast population - as India has failed to do until very recently, and which may fundamentally change international cricket, if they succeed in doing so. Or not have the money or opportunities to develop what talent they have. But they are always slaves to their playing base. In the long term, that's the mean they regress to. Unless someone can show something has fundamentally changed in the production of Australia's cricketers, that breaks a hundred years of landing on or near that line pretty consistently, it is safe to assume Australia will find decent batsmen again. Given the comparative youth of this side it may have already, and we must merely be patient. In the long term Australia and England are evenly matched. In the short-term, development and selection matter in order to get the (probable) best players in the team for each match. There are good reasons to think Australia does this badly which I'll explore in part two. Andrew Nixon (@andrewnixon79) joins me direct from European Divsion One T20 to discuss the tournament. We revisit the ICC conference and discuss the things the ICC don't make public. There are reviews of the Ireland-Netherlands WCL and Scotland-Kenya I-Cup games, the EAP and Americas U/19 qualifiers, and the Irish women's matches against Pakistan. And we preview World Cricket League Division 6, the Auty Cup and Canada vs UAE I-Cup game, and the women's WT20 qualifiers. It is a busy time and there is a lot of news as well. Low scoring games can be dangerous for superior teams - see below for example - and this was a particularly low scoring game. Berrington (62) and MacLeod (67) anchored either end of the first innings, and Nehemiah Ohiambo 3/29 and Ngoche 4/58 took wickets did the same to restrict them to 212. The response was underwhelming though as Kenya struggled in the conditions - as they did all tour. Evans taking 6/30. Only Chalmers got going the second time around, making 106, Varaiya taking 5/44; but it was enough to set an improbable target of 342. Collins Obuya (91*) made runs, but was fortunate in doing so, and it ended a fairly miserable tour for the Kenyans, now out of contention in both the WCL and I-Cup. Scotland will need to beat Ireland in the next round to make the final, and hope for results elsewhere. A possibility, given their opposition has qualified, but the winner of Afghanistan and Namibia has much the easier run. Most tests produce straight-forward narratives, a few key moments lead to an inevitable victory. Close tests offer no straight-forward narratives; it is easy to find 15 runs in five days of cricket. In a match marred by numerous poor decisions, - and (naturally) by many uncertain ones un-resolvable regardless of time and replays - those abound. What matters is that having been in a position of considerable weakness, Bell, with style, and Broad, in a manner that always gives the impression that bowlers are bowling to his plan, put on 138 runs, turning a gettable target into an unlikely one. Australia's batting was as bad as advertised, falling to poor shots and inadequate techniques. England know they need only keep the ball in the right place and wait. The only time they didn't, two tenth wicket partnerships almost took the game from them. The first, led by Agar's classy 98, beggared belief. He has the necessary tools to be a useful, even very good batsman. His bowling needs work, being prone to putting the ball on the pitch, instead of rising through the crease to take advantage of his height and loop. Agar kept England contained though, which is what he should be judged on. Australia's other bowlers were poor but lucky in the first innings, and better but not in the second. Siddle proved his worth but Australia can't reasonably carry two bowlers with loose lines on slow pitches against quality batting. In the end, wides and no-balls by themselves lost Australia the test, and Harris, and more particularly, Bird (and Faulkner), are better suited to the conditions. England's bowling burden rested heavily on Anderson, particularly when things got tight. Finn took two wickets but was expensive, and Broad - albeit injured - was worse in the first innings. They won't struggle to bowl Australia out though, assuming they get enough movement at times, but might reconsider tailoring pitches for Swann. England's best chance of winning easily is to make heavy runs and count on being able to prevent Australia doing likewise. Pitches that favour the bowling open them to collapse, and mean a rash of poor shots - as in the first innings - will cede advantage. Lord's has a recent reputation as being flat, which should suit an English side which, when all is said and done, won a match in which they played badly, had a slight advantage in the umpiring, but the misfortune to face two tenth wicket partnerships of unusual size. This isn't as good an English side as two years ago, and Australia have potential - being young, we may one day look back and wonder how a side with so many good players didn't win - but earlier predictions look more accurate, not less, after the first test. As we lead into two massive months of cricket at this level, Andrew Nixon (@andrewnixon79) and I discuss decisions made at the ICC conference and how their effect. We review the Ireland-Netherlands I-Cup and Scotland-Kenya WCL games and preview their reverse fixtures. Andrew catchus up with French opening bowler Rory Gribbell (@RoryGribbell) to chat about their performances in the Continental Cup and preview the ICC European Division One. In news, there are warmups and tournaments from Ireland to Romania in both men's and women's cricket, associate players continue to seek greener pastures, and there is sad news that Arul Suppiah will retire from all cricket. Direct Download Running Time 39min. Music from Martin Solveig, "Big in Japan"
There isn't that much to say about a below strength Ireland handily defeated an even weaker Dutch side. Anderson scored a century with support from Kevin O'Brien and Mooney, before teenage spinner Doram took over, finishing with 5/82. 332 was well above par though, as Netherland spluttered to 148 with only Cooper (51) making any runs. Ireland's third innings wasn't a whole lot better although White made 62 and the target was a weighty 407 by the time they were out for 222. They could have enforced the follow-on though, in retrospect, as Dockrell took 6/39, with 3/32 in support by Sorensen, who ripped out the top-order. Ireland's victory lifts their rating a little higher, and puts them through to the I-Cup final in December. The Netherlands become officially out of contention, although the second spot remains open, at least for now. Australians living in hope, have had to look back to 1989 for a side seemingly so abject coming to England. But I'd argue 1993 is more apt. Coming off a summer of Ambrose-led maulings and a tame one-all draw in New Zealand, only Boon of Australia's top six of the time, had any great claim to form or a place, and in any case he wanted to move down the order; add in a paper-thin and bowling lineup with an inexperienced spinner and the English press was not-so-quietly confident. That side succeeded, and more, but they did so because the English side they were playing was rubbish. And even then, by the first test only two places in the order were truly up for grabs. The current bowling line-up is far from paper-thin, albeit inexperienced. But no place in the batting lineup is set, except for Rogers and Watson, and that is an entirely new combination. It is, though, relatively easily to assess the Australian batting, because all the candidates have their flaws and will likely make no more or no less than any alternative (that was also true in 1993 if not almost always). The batting is dire. The only genuinely unlucky candidate missing out is Cosgrove and his record, if better in England than Australia, isn't great. Their flaws are well documented, and legion. Regardless of whether Australia's attack can match England's they still have to bowl to England's batting, so they won't perform nearly as well. If, if Clarke, Rogers and anyone can make some runs, and if conditions break well, Australia can win a test or more. But a series win is very unlikely. How unlikely I have already posted. Arguably Australia are not as bad as the Indian tour made them out to be, but England can improve on recent performances too. Swann and Pietersen are returning, Root is finding his feet, and the Australians seem likely to pick bowlers with X-factor but poor records (Starc) over better alternatives (Faulkner, Bird) which suits cautious players who prey on mistakes like Trott and Cook. Australia can still make something of this series, and if they selected the perfect side - which they might yet, so uncertain is the team - then they could challenge an English side that hasn't impressed overly in the previous 12 months. But if you are looking to bet, 3-1 or 2-1, the scorelines from most recent series are the ones to choose. Andrew Nixon (@andrewnixon79) and I are joined by Jamie Harrison (@JamieUSYCA), president of the United States Youth Cricket Association to look back on a match played 100 years ago at the Germantown Cricket Club between a touring Australian XI and a combined United States and Canadian side; the last first-class game played in the United States for 89 years; a match won by Australia by 409 runs. We discuss the state of cricket in the USA and Philadelphia at the time, and what that can tell us about cricket and its development in the USA today. "Even if an application is received, it will be refused, and no player will be given sanction by the board to accompany such team. If any Australian cricketer proceeds with a team to America without our consent, he will never play cricket in Australia again." Direct Download Running Time 67min. Music from Irving Berlin, "International Rag"
Another year, another Melbourne International Animation Festival. Hopefully Malcolm will hold to his statement of not making it 11 days next year, although it is invariably the last Saturday that almost kills me - going to bed at 2am and waking up for a 7am podcast probably didn't help. The extra time meant I saw more of this festival than I had in previous years. Indeed, the only bits I'd have liked to see were the CG Symposium - passed on in favour of the Canadian Indie programs, and the Australian program, that is inexplicably the only competition program not repeated, but that was a fault in my scheduling. Wind Int. 2 - Wore thin after several viewings, but the interaction of animation and wind always works. Cleo's Boogie Int. 4 - Good song, good mix of techniques, but mostly the song. Stewpot Rhapsodie Int. 5 - A mother cooking with loads of movement, charming aesthetic, and a fantastic soundtrack. A La Francaise Kids 2 - Chickens in 18th century Versailles. Hilarious film. Bydlo Int. 1 - An oxen comes to life out of the clay. Didn't like the plot, but beautifully constructed. MacPherson Int. 5 - One of those languid oil painted films that always look superb. Here and the Great Elsewhere Int. 5 - Ditto pinscreen animation, although this pushed a rare technique along too. An amazing film. Jailbreak Abstract - Really well constructed abstract set to a syncopated rhythm. Illogical Imaginings Next. Aust. - Characters rolling into each other is old hat, but this was well constructed. Linear Int. 1 - Simple concept, a 2-inch man painting a road, but executed well. Marcel, King of Tervuren Int. 4 - The sort of personal story that animation produces very well. Lovely depth of visuals too. Junkyard Long - Live diverge then meet. This took a while to get to an obvious conclusion, but it was worth it. Edmond was A Donkey Long - Long features have an advantage when it comes to plot, but this still kept me interested. An odd little story with a silent title character, much put upon. The Fantastic Flying Books of Mister Lawrence Lessmore Kids 2 - A genuinely touching film, simply and beautifully animated. Tram Int. 3 - Was tempted not to mention it, but it is very well paced and funny. Oh Willy Long - Might have gone under the technical category too, for the texture and light, but the sheer oddity is its most endearing feature. The Brick Bizarre - The sort of film that should be in Late Night Bizarre instead of the crude poorly animated rubbish. Completely odd-ball. A final shout-out to the Kevin Schrek documentary The Persistence of Vision. The three decade long failure to produce a feature film of epic proportions, largely because it seemed to be epic mostly for the sake of being epic, was fascinating through-out. That the animators involved also meant that Richard William's film bridged from the golden age of animation to today somehow made it important and valuable in spite of itself.